I purchased this pasta earlier this week. Read to find out what I thought about it. 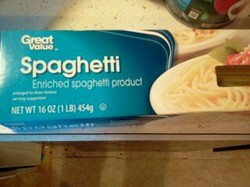 Product Description: Boxed spaghetti pasta from the Great Value bargain brand. This is available exclusively at Wal-mart for $1 per one-pound box. I ended up picking up two boxes of this pasta a few days ago when I was out doing some routine shopping and used the spaghetti this past Friday night as part of our weekly spaghetti dinner and family movie night, preparing two boxes. I actually don’t shop at Wal-mart all that often, at least not for groceries, because I prefer shopping at our local, family-owned grocery stores (which also happen to be much more convenient because I pass them on my way to work). However, I needed a new pair of blue jeans and, since I was at Wal-mart anyway as a result (my parents had given me a gift card for my birthday), I decided to grab this pasta while I was there. Since we do eat quite a bit of pasta in our house, I’ve learned some brands are definitely better than others. And, after trying this brand for the first time in a long time, I have to admit it would fit in that “better” category. There were a couple of things I really liked about this particular brand of spaghetti pasta. The first one, obviously, was the price. While the $1 price tag wasn’t the cheapest I’ve purchased pasta for, it was still relatively reasonable and easily fit in my shopping budget. The thing that really surprised me about this product, however, was the overall quality. As I said, there is definitely a difference between pasta brands and, more often than not, a lower price means we do have to sacrifice some quality. This, however, did not seem to be a problem with the Great Value brand of pasta. One thing I noticed about this spaghetti right away was the clearness of the water when I boiled it. Many bargain brands will start to fall apart when cooking and will leave the water with a thick, white cloud. That was not the case with the Great Value brand, the water was a little cloudy but not to the point I really was expecting it to be. Another thing I noticed when cooking this pasta was it didn’t clump up like some other bargain-priced spaghetti I’ve purchased in the past. This was something that was definitely appreciated because it does typically become a little bit of a problem when I’m cooking more than a pound of it at a time. As far as flavor goes, again, we had no complaints. In fact, my oldest daughter couldn’t stop complimenting this particular pasta because she liked both the taste of it and the texture (it was “chewy” as she described it). Considering she is one of the pickiest eaters alive, that compliment really does mean something. Since I don’t go to Wal-mart very often, this isn’t a brand I expect to purchase all the time. However, if I happen to be shopping there, it is a product I definitely would not be opposed to purchasing again and do recommend. Easy ways to reduce your monthly food costs that don't require any major sacrifices or lifestyle changes.